thyssenkrupp Industrial Solutions is introducing a number of new solutions for the minerals, mining and aggregates industries at Bauma 2019 in Munich, Germany (8 – 14 April). Those solutions include new equipment and services that help improving process efficiency and sustainability as well as driving down costs. 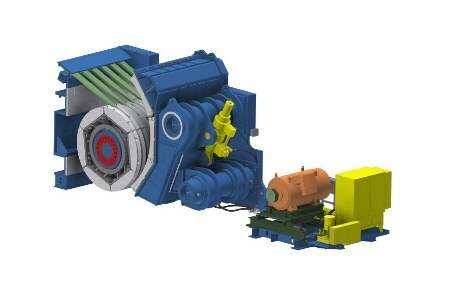 With its new eccentric roll crusher (ERC) thyssenkrupp Industrial Solutions has developed a solution for the primary reduction of hard rock and ore. The new crusher (pictured) is particularly compact and robust. Its patented design with an integrated screen permits throughputs between 600 and 8000 metric tph. Suitable for use both underground and in surface operations, the ERC offers significantly higher efficiency and flexibility than conventional primary crushers in the processing of hard rock. It will make its world debut at the Bauma 2019 show in Munich. “With the new ERC we have developed a technology that is the first of its kind. Its innovative design combines the advantages of conventional primary crushers with solutions to their typical disadvantages, such as large height. As a result the ERC can be used in underground and surface mining operations and in quarries to process ore and hard rock more effectively”, said Detlef Papajewski, Head of Mineral Processing. In addition, thyssenkrupp Industrial Solutions will present its new mobile stacking bridge lizard®. This solution for heap leaching and dry tailings stacking combines two proven technologies – the conveyor bridge and the tripper car – in a new way. The lizard decouples the crawler-mounted tripper car from the conveyor bridge, enabling it to be controlled independently of the bridge. Decoupling the tripper car from the conveyor bridge has several advantages: the transitions between the bridge segments are easier as there is no stress from a traveling tripper car on top of the bridge. As the loads on the bridge sink, the overall construction of the bridge outweighs the additional chassis and structure of the tripper car. This way the product saves weight and costs accordingly. In addition, a larger dump height and longer outreach are possible. A key advantage of the lizard is its multi-crawler chassis which allows more flexible operation. thyssenkrupp used its expertise in this area to develop a unique solution that improves productivity: A multi-crawler chassis with no override control, the so-called “float system”, is attached to the tripper car. The double crawlers with no steering cylinders ensure unrestricted maneuverability in all directions. The system can be attached to any crawler to avoid the large turning circles of conventional gearing systems. variopactor is a newly developed reversible impact crusher. The name speaks for itself: With its modular design, the variopactor can be adapted to a wide variety of applications. Using different rotors, aprons, and the optional grinding path, it can produce gravel, chippings or sand. In addition to its versatility, the variopactor offers consistent product quality with high cubicity and significantly reduced downtime for maintenance. For the first time thyssenkrupp is offering the option of Metal Matrix Composite (MMC) blow bars with high-carbide inlays. Depending on application and customer requirements, the matrix material for the MMC blow bars can be made from different steel alloys. The high-carbide inlays are cast into the matrix material in the main wear zone along the edge of the blow bars, where most of the crushing work takes place. Compared with traditional high-carbon chromium steel, the new MMC material significantly increases the service life of the blow bars. Along with the new minerals and mining equipment, thyssenkrupp will present a broad range of services for stockyard and port operations. Every mining company and port operator faces the challenge of ensuring the health and safety of its staff and increasing productivity while reducing operational costs. With the fully automated and digitised smart stockyard and port solutions thyssenkrupp addresses those challenges and helps its customers to stay competitive. thyssenkrupp's services and solutions for smart material handling include, among others, digital maintenance assistance systems (MAS), systems for stockpile management and drone-based inspections. In addition, all conveyor systems and handling machines involved in the process function fully automatically and can be operated and controlled from a central control room. Anti-collision systems ensure the safe operation of large-scale equipment.